Sunday, March 10, 2019 3:00 p.m. Explore the history of 200 years of Classical music in one short afternoon: from Bach’s baroque Sonata for violin and keyboard, the first example in music history of a Duo Sonata conceived for equally important parts, to Igor Stravinsky’s virtuosic ‘Suite Italienne’, the composer’s transcription of his neo-classical ballet music based on the comedy “Pulcinella” from 1700. Stravinsky said: “Pulcinella was my discovery of the past, the epiphany through which the whole of my late work became possible. It was a backward look, of course—the first of many love affairs in that direction—but it was a look in the mirror, too”. 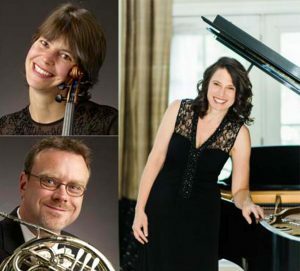 Finally, we lure you to the Romantic world of late 19th century Vienna with Brahms’ masterful Horn Trio, the first masterpiece written for this combination of instruments, featuring the rich sound of French horn played by none other than Rich King. Thank you for your interest in Close Encounters: Johann Sebastian Igor and One French Horn! We’re sorry, but due to the popularity of this event, we are now accepting wait list requests only. Please email events@heightsarts.org if you would like to be placed on the waitlist. We will notify you if tickets become available.